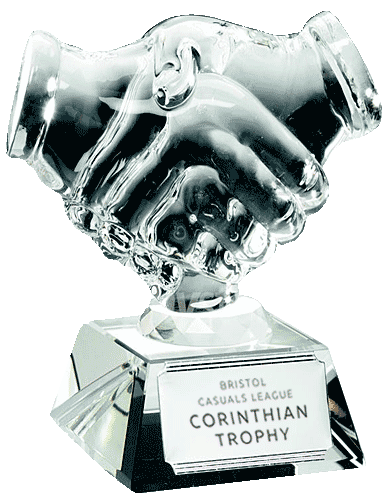 The Bristol Corinthians League is committed to playing football in a corinthian - yet competitive - spirit. To ensure that clubs adhere to this basic philosophy, and to provide valuable feedback to all concerned, each club is asked to score the opposition after each game, with a mark out of ten for the spirit in which they played the game. The Corinthian Trophy, given to the club with the highest average corinthian score is therefore, in some ways, the most important trophy to be won each season. :: As of 2016/2017 season, to reduce the risk of any team being influenced in their Corinthian scoring through seeing what their opponent has awarded them, individual Corinthian Scores awarded are NOT made visible on the League website. :: Scores are logged and totalled in the database as before, and the Corinthian Table will show each clubs' Corinthian Average Score (i.e. aggregate score total divided by games played). :: Each club will automatically appear in the Corinthian table once they have been scored on THREE fixtures. This makes it less obvious what they have been individually scored in initial matches. :: Any club not achieving a Corinthian Average Score of 8 at the end of the season may, at the discretion of the League Committee, not be invited to re-join the League the following season. :: The League may, at its' discretion reveal a particular Corinthian Score to a club, if there is a dispute over low marking.